A breath test instead of a blood test. That’s how much easier it is to use the test for industrial catalysts developed by chemists at Utrecht University. The test uses fluorescent molecules to literally show whether catalyst 1, 2, or 3 works better than the others. This makes it much easier to work on improving the catalysts, which allows production processes in the chemical industry to become increasingly more sustainable. The researchers, under the leadership of Prof. Bert Weckhuysen, will publish their results in Nature Chemistry of 5 November. 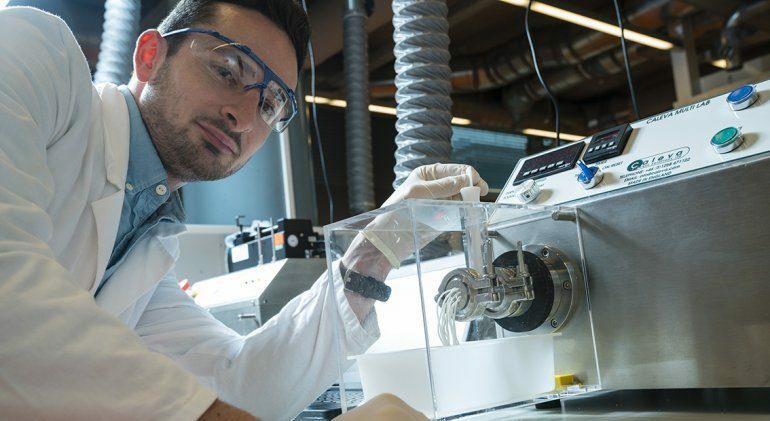 In their research, the chemists from Utrecht studied the sustainable production of methanol, one of the building blocks for products such as plastics. Sustainable methanol can be synthesised from CO2 and hydrogen gas produced using wind- or solar energy or household waste. The catalyst is needed to ensure that the reaction produces as much methanol and as few by-products as possible, at the ideal temperature. The catalyst’s composition and porousness are important aspects of the process, but so is its shape. Read the full interview on the website of Utrecht University in English or Dutch.